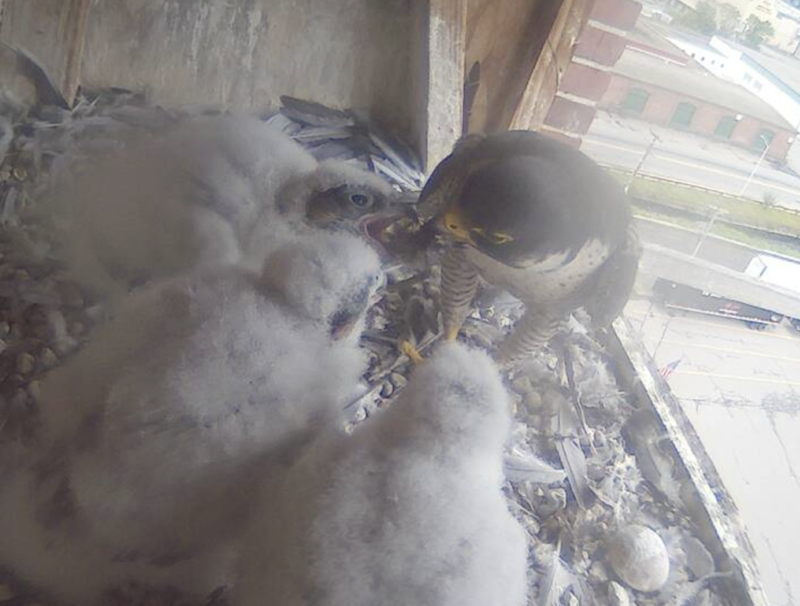 You are browsing the Blog for peregrine falcon hatchlings. Day 26: leg bands today! Sunrise time this morning was at 5:07 AM. 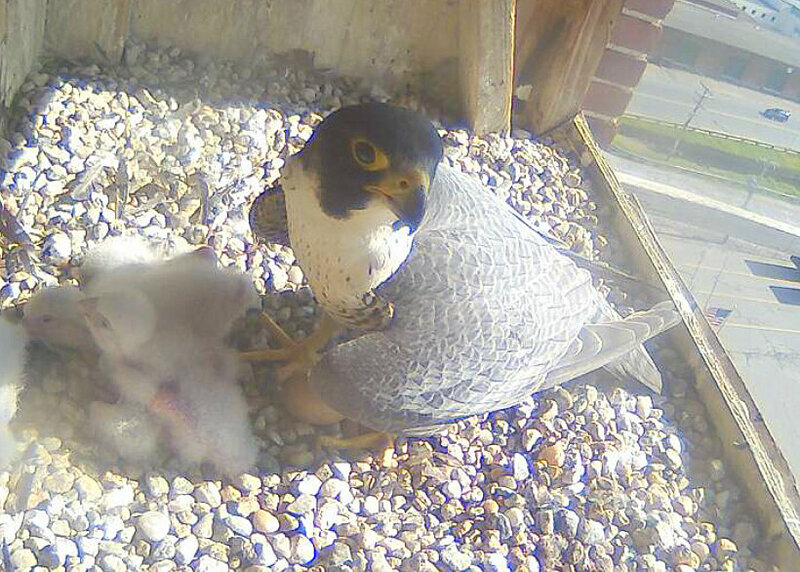 The peregrines started off the day under clear skies, bright sun, light wind, and temp at 57F. The day ahead calls for mostly sunny skies, with a high near 80. West wind 7 to 10 mph. 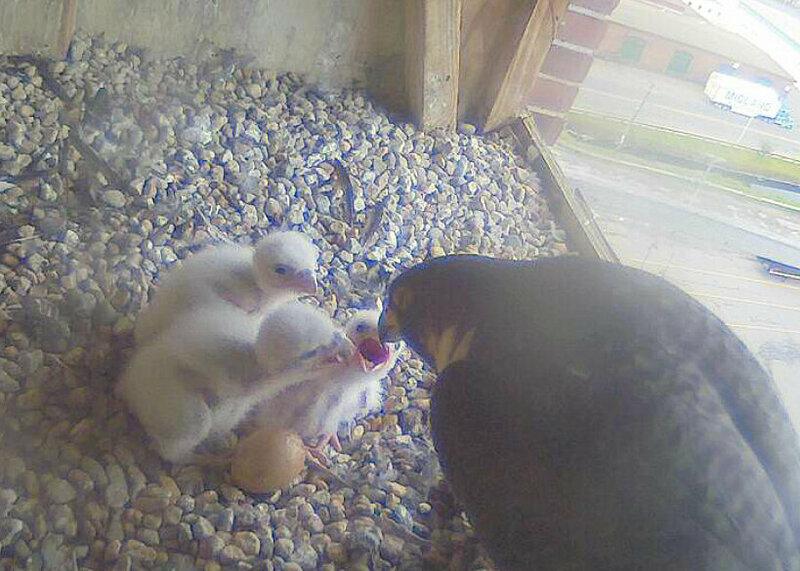 Research has shown that male peregrines frequently cached food, both when feeding the female during incubation, and when feeding her and the nestlings later. Both sexes use these food stores and up to 35% of food items may come from nearby cache locations. Half-eaten items may be returned to the cache for a further meal. 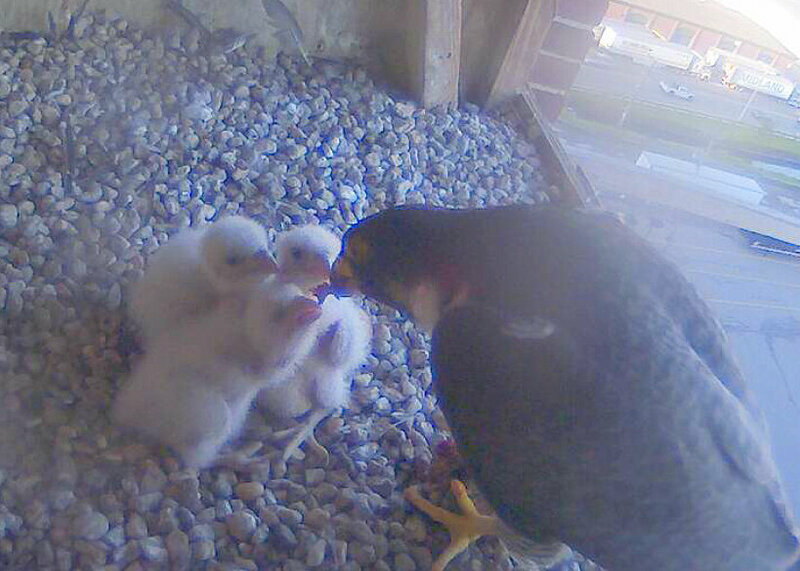 This photo shows the chicks in a huddle with female on the perch. 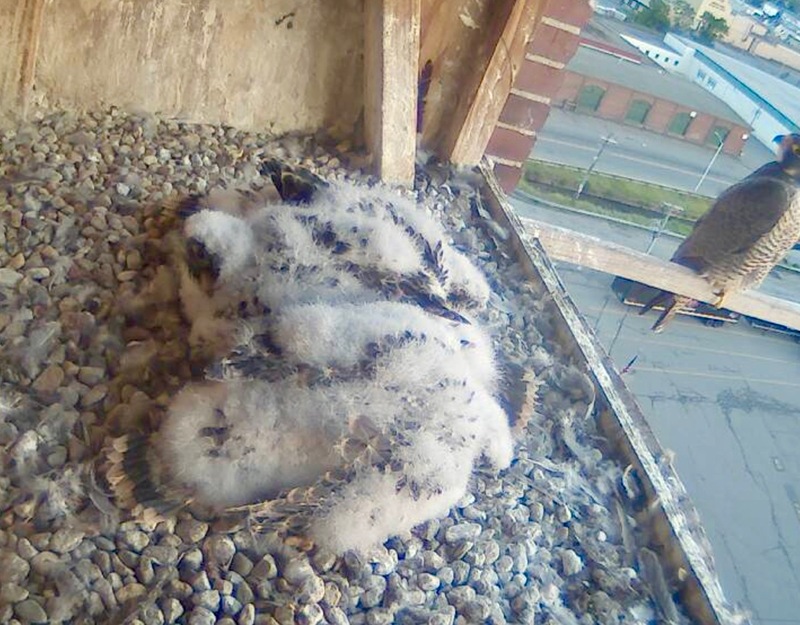 At day 26, the development continues in terms of the increasing covering of juvenile feathers on the breast. The area on the head bare of down also continues to expand. Today was banding day. In this photo, you’ll notice the chick in the foreground has a new leg band. More details on the banding to follow! 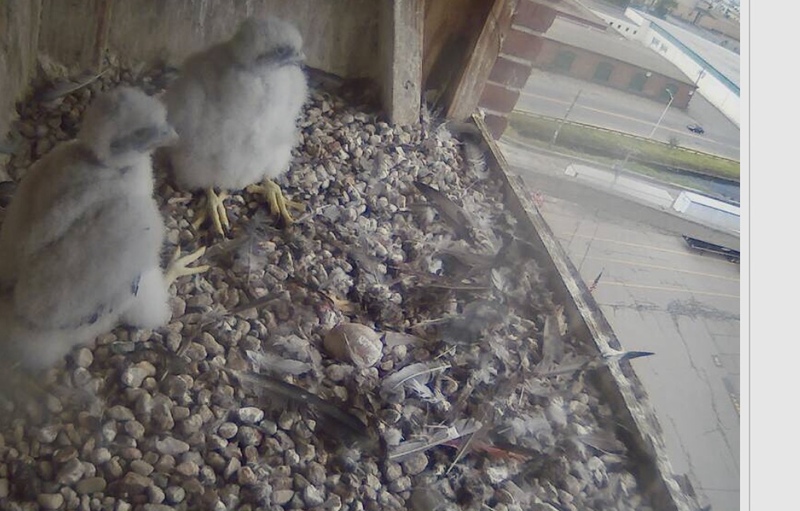 The peregrines started the day off under overcast skies, with with winds from the SW at 6MPH, and temp at 57F. The day ahead calls for partly sunny skies, with a high near 75. Southwest wind 7 to 11 mph. Very nice! In their fourth week of life, the chicks undergo significant changes almost daily. Around day 25, the brown tips to the secondaries become clearly visible, and the number of colored feathers visible on the breast increases noticeably. Behaviorally, they are rarely resting on their tarsi anymore at this age. 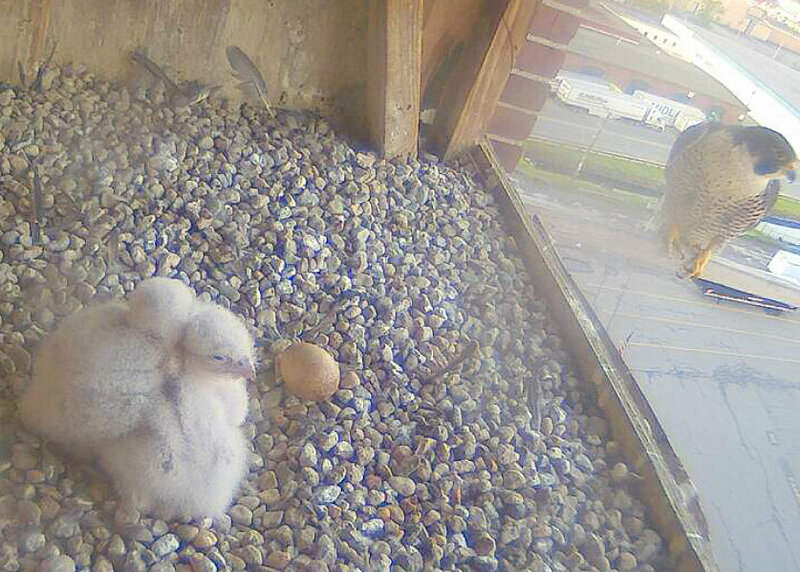 IN this image, the chicks are loafing in the nest box, and the female is perched looking in…..notice the changes in feather coloration. In terms of feeding times, the pattern is irregular overall. The young are twice as likely to be fed during the early morning and evening periods than middle of the day. There tends to be a higher frequency of feeding visits during morning or late afternoon/early evening. Interval times between feeding visits usually averages about 2 hours, and average duration of a meal runs about 8-11 minutes, with duration of meal time increasing a bit as the chicks get older. Here we see a late day feeding just before 7:30 PM, with sunset at 8:18 tonight. 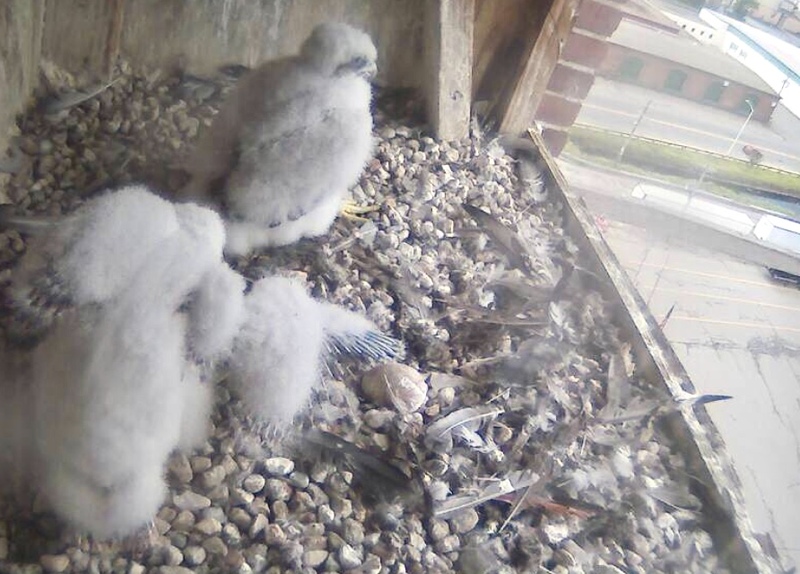 This morning the peregrines began the day with overcast skies, winds from the NE at 3MPH, and temp at 55F. The day ahead calls for cloudy skies, then gradually becoming mostly sunny, with a high near 66. Calm wind becoming southeast around 5 mph in the afternoon. By day 24 the facial pattern behind the eyes is becoming increasingly evident, and some colouration is becoming visible on the upper breast as juvenile feathers develop beneath the down. The legs are now just about fully developed, and thus banding can take place from this time onward. For these three peregrines, banding is scheduled for the end of the this week. A number of other chicks in the extended Boston area either have been banded, or are scheduled to be banded. After the chicks can stand, at 22-23 days, the begging posture becomes more horizontal, though they feed in a normal standing position, and direct themselves at the parent’s beak. At about this age, they will start to regurgitate castings composed of indigestible remains, and wiping of the sides of the beak back and forth against the nest box edges. Also, at about 24 days, signs of self-feeding became more pronounced with nestlings starting to garb at food instead of just begging for it! Day 22: flight feathers growing! This morning the peregrines started the day with fog and light rain, winds from east at 5MPH and temp at 52F. The day ahead calls for showers before 2pm, then showers likely with areas of drizzle between 2pm and 3pm, then areas of drizzle with a chance of showers after 3pm. Patchy fog before 5pm. High near 52. Northeast wind around 8 mph. Chance of precipitation is 90%. New precipitation amounts between a tenth and quarter of an inch possible. The chicks are approximately 22 days old. As we watch these chicks, the amount of black protruding along the edge of the wing indicates that the flight feathers continue to develop at a rapid rate, but it isn’t until the wing is spread that the state of development can be fully appreciated. 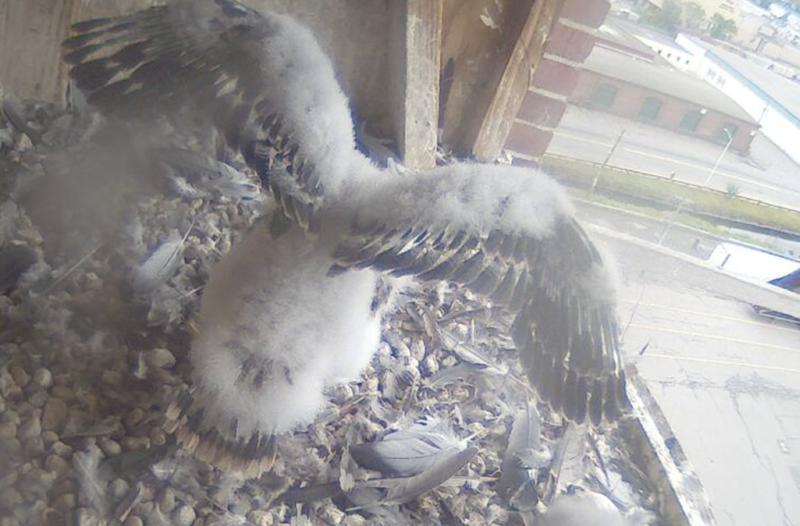 The web cam angle, from above, makes this view of the underwing a bit tough to observe. The underwing view, when available, reveals that the primaries are barely emerging from their shafts, while the secondaries are already considerably more advanced. Here they are, all three in active feeding mode again! Overall, the developing young peregrines tend to live together amicably, and there are usually not any epic battles, which are so characteristic of some other raptors, notably Bald Eagles. 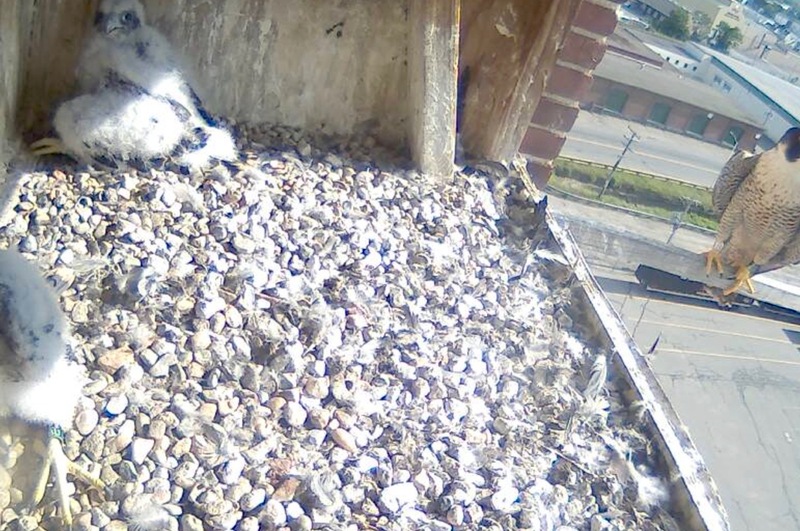 Young peregrines are given to socialization with each other in the nest ledge, right up to and well past first flight. 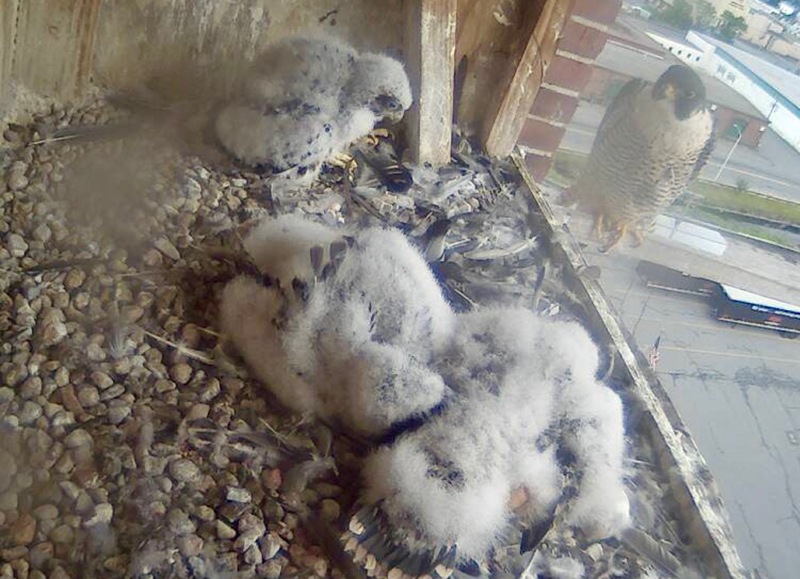 The peregrines started the day under partly cloudy skies, wind from NE at 9 MPH, and temp just over 60F. The day ahead calls for sunny skies, with a high near 67. East wind around 11 mph. We’re now around the three week point for their growth and development. The first juvenile feathers begin to poke through the down on the breast. The chicks continue to rest on their tarsi much of the time, rather than standing on their feet, but this balance shifts quickly in the days to follow. This is the time when wing and tail feathers begin to appear, and wing flapping becomes more vigorous. The young are now voracious and eagerly watch the return of the parents to feed them. They are brooded little, but still have a marked tendency to huddle together, this being a warmth conserving adaptation. Chicks at this age have well developed beaks and powerful feet, with quite large talons. Day 18: chicks in hiding! Another beautiful morning…..today the peregrines started things off with sunny skies, calm wind conditions, and temp at 54F just after sunrise at 5:10 AM. The day ahead calls for more sunshine with a high near 82. Light south wind increasing to 5 to 10 mph in the morning. Winds could gust as high as 22 mph in the middle afternoon hours! 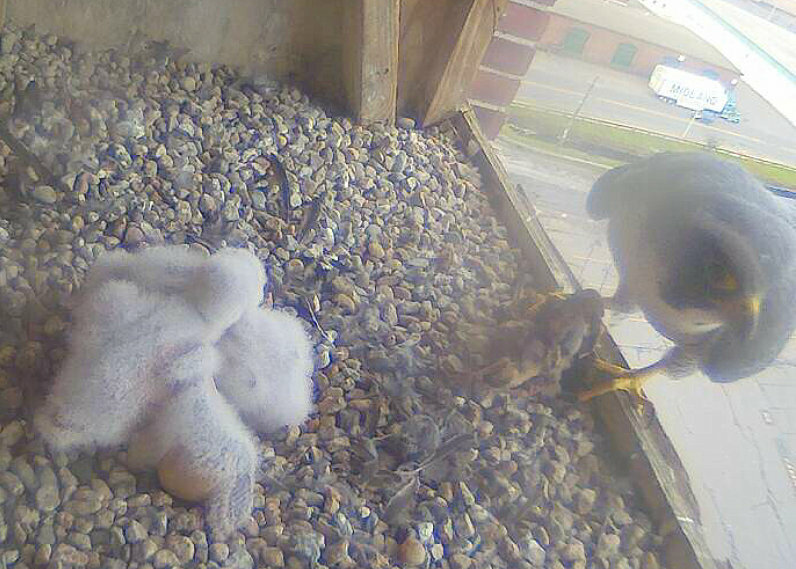 Over the past few days, the chicks have shifted to the north end of the nest box, up and under the web cam. At times, it looks like no one is at home, and yet they are there. Last year, a number of frantic emails came in with alarm and concern that somehow the chicks were gone…..not! This morning, same thing, just out of sight, but with the female, with her tail just visible, out near the end of the perch pole, keeping a close eye on her little ones. 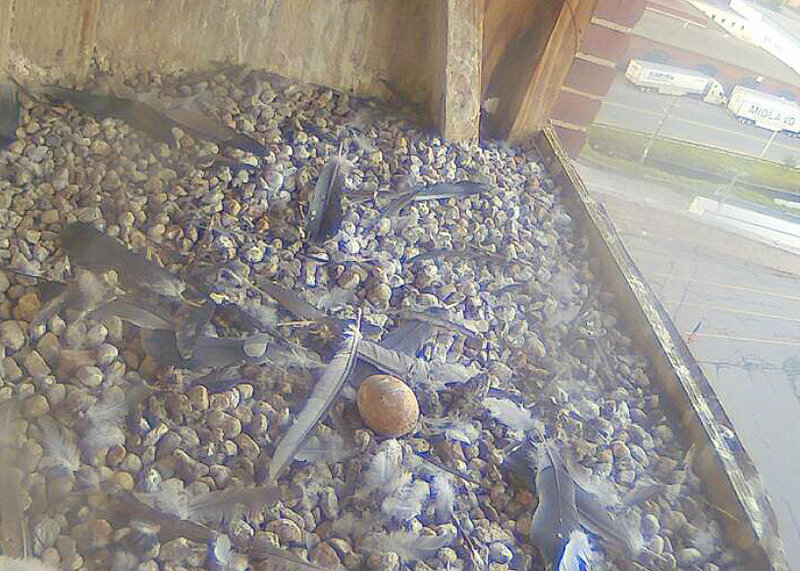 The unhatched egg remains intact through it all, and the nest box continues to be littered with feather debris from left over meals. Just after 6:30 AM, the female returned to the nest box with a morning meal. At first she met the chicks in the lower left hand corner and then the female moved to her right and more towards the middle of the box. This allowed for a fuller view of all three chicks. It provides a nice perspective on how the chicks have grown larger, yet still are somewhat patient when being fed! Memorial Day started off under overcast skies with fog and mist, wind from the north at 9MPH, and temp at 52F. Sunrise time was at 5:12 AM. The forecast for the day ahead calls for patchy drizzle before 10am. Cloudy, then gradually becoming mostly sunny, with a high near 68. Northeast wind around 5 mph becoming calm in the morning. WOW!….from near 90F Saturday afternoon, to stuck in the 50s yesterday afternoon, it was about as big of a turnaround as you’ll see around here as August weather went to April real quick. 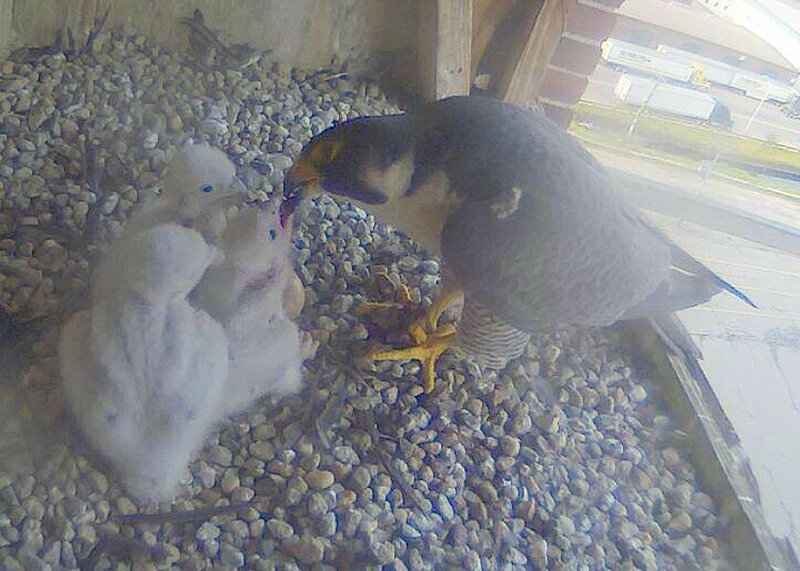 The week ahead brings warmer temps and lots of sunshine for the growing peregrine chicks! Now we are around day 15, and the chicks are beginning to enter the “hunchback” phase, during which they are often seen in the pose above, with their feet splayed out in front of them and their head angled forward. Today, we continue to observe the chicks in the ongoing lazy mode of lounging and sleeping in the back left corner of the nest box, with the attentive female always nearby. 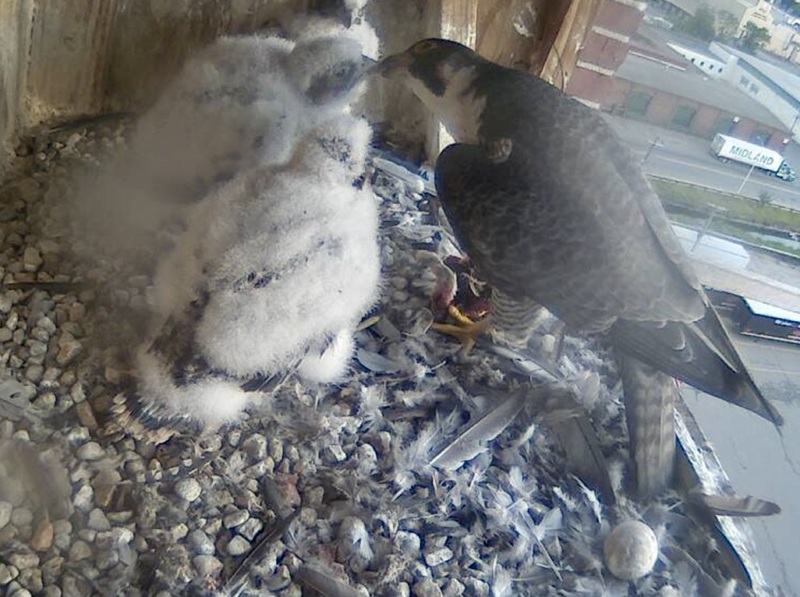 Around 2PM, the female returned to the nest with prey in talons. Once she settled inside, the chicks gathered in the semi-circle position, and they provided a nice look at their feet splayed out and they all stood in hunchback mode! For the peregrines, the morning started off under clear skies, winds from the south at 9MPH, and the temp at 57F. The day ahead calls for sunny skies, with a high near 89. West wind 7 to 16 mph, with gusts as high as 29 mph. Sunrise this morning was at 5:14 AM. This morning the chicks were first seen int he next box by themselves with the female nearby on the perch pole. By 5:40 AM she was back in the nest box preening and scratching herself aside the chicks. Just after that, she settled on the outer edge of the nest box looking out to the west, and the chicks remained in tight huddle formation with the the addled egg still close by. 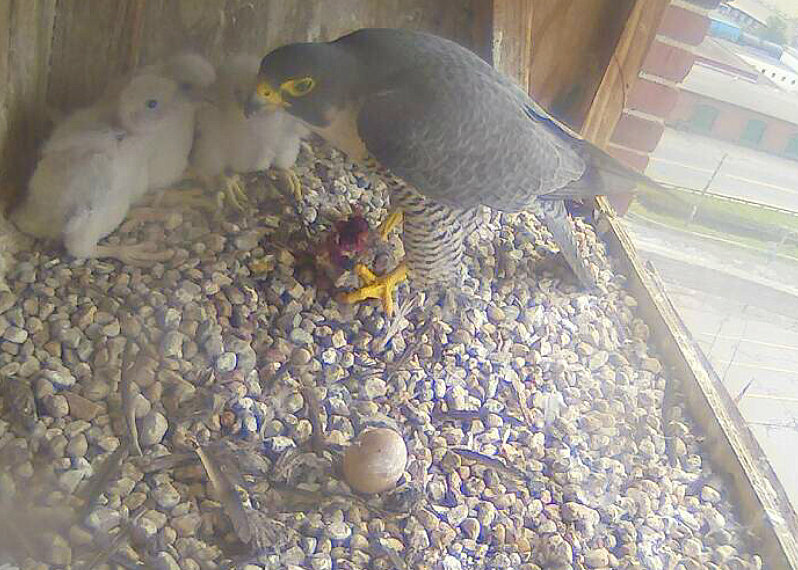 Right about 7:30 AM, the female returned to the nest box with fresh prey and the chicks had a quick feast. Overall, The little ones are moving around more, wing stretching and being playful with each other. They are literally a tight bunch at this age! As was mentioned in a prior post, the adults will shelter the nestlings from strong sunshine, and rain, as may be needed, when they are too large to brood but not yet protected by their own feathers. The sheltering falcon half-spreads its wings, as seen in this photo. As the overall weather warms up, and these chicks are subjected to hot, intense sunshine afternoons, this type of sheltering may be important and helpful. The female was seen with her mouth wide open, and tongue hanging out, a clear sign of being somewhat overheated. The peregrines started the day off under clear skies and bright sun, calm winds, and the temp at 53F. The day ahead calls for mostly sunny skies, with a high near 69. Light north wind increasing to 5 to 9 mph in the morning. Just before 5:30 AM, the female was seen hovering near the chicks but not really brooding them. The little ones continue to stay close ton one another in a constant huddle formation. By 5:30, the female moved out to the perch pole, keeping an eye on her chicks but remaining very close. 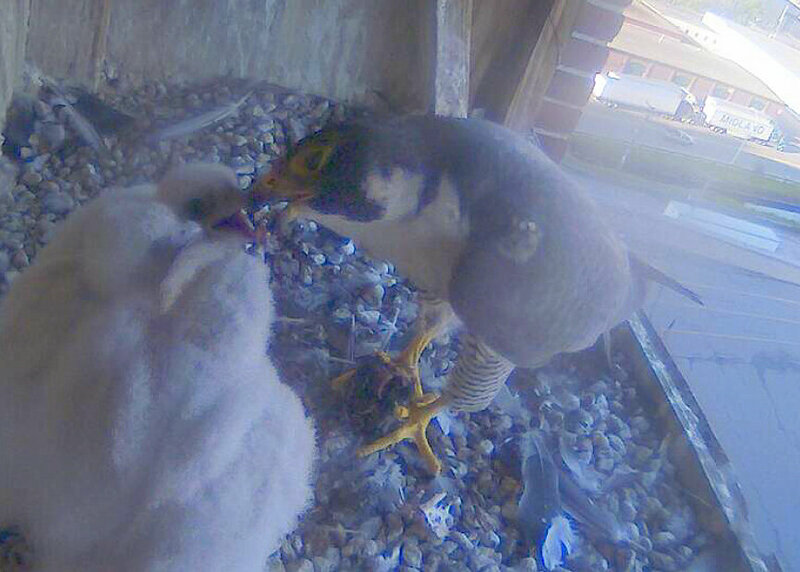 Finally, around 6:30 AM, she returned to the nest box with prey in talons and feed the hungry little ones! The morning started off under mostly cloudy skies, winds from the SW at 6MPH and temp at 57F. The day ahead calls for partly sunny skies, then gradually becoming sunny, with a high near 83. Southwest wind 5 to 9 mph becoming northwest in the morning. The sunshine will arrive later today and stay with us into the weekend. Just before 6 AM, the female was seen in the nest box preening, wind stretching, and watching over the little ones. She departed and returned moments later, again with food in her talons. The hungry chicks were happy to receive a morning meal. The egg has been moved back into the huddle! After the feeding session, the female moved to the perch outside the box for a while, and then hopped back inside the nest box. She settled back in for a bit, spent more time on perch and then returned to hover over her brood! By day 10, the chicks have already grown visibly, but remain covered in white down with pink patches of skin still showing through in some areas. 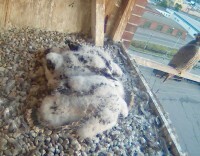 Around this time, the young peregrines grow a second coat of down. From this age onwards, nestlings become more active and strong though the nature of their movements does not change markedly for another week or so. They are brooded less and less during the day and become more vigorous in their movements about the nest box, including backing up to squirt their feces outside the nest box. Vision develops strongly and the young, when hungry, scream and clamber towards an arrived parent. Most of the day is spent sleeping, up to about 16 days, but the comfort movements, become more developed, and include foot nibbling and hitching of the wings into adult position.